EMV chip cards, which are far more secure than magstripe-only cards, are steadily making their way into mainstream rotation. 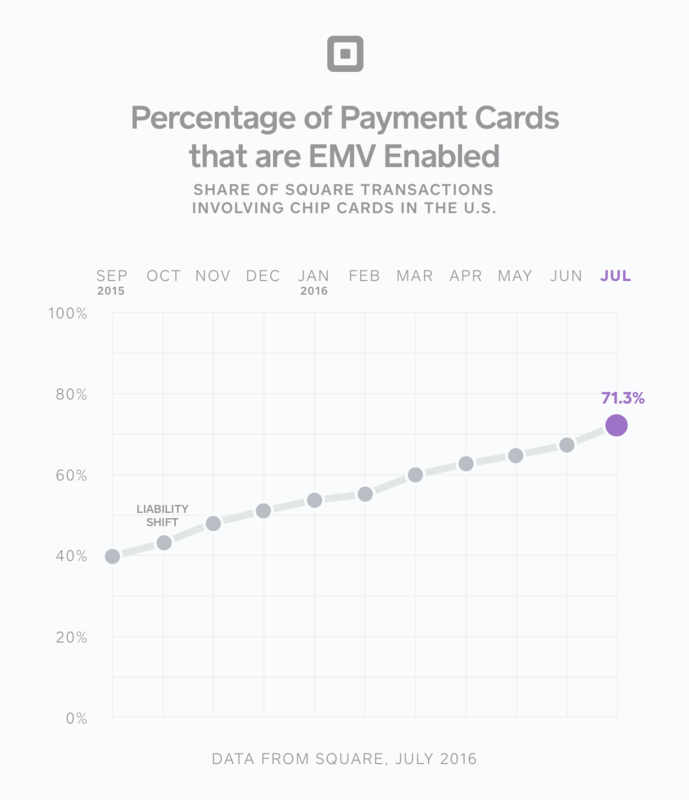 In July 2016, roughly 71 percent of cards processed through Square were EMV chip cards, up from 40 percent in September 2015. So if you’ve been dragging your feet on getting an EMV terminal that can accept them, it’s time to jump on it. In fact, if you haven’t implemented an EMV terminal yet, you could be putting your business at risk. Why? Because something called the EMV liability shift went into effect in October 2015. That means now businesses that aren’t accepting EMV chip cards could now be on the hook for certain types of fraudulent transactions (whereas previously the banks ate this cost). So to protect your business from these charges, it’s essential to get EMV compliant ASAP. The reader that covers you today and tomorrow. Fortunately, EMV compliance is easy. Square’s EMV terminal is just $49 (hundreds of dollars less than most solutions) and accepts both EMV chip cards and mobile payments like Apple Pay. And it’s super-easy to set up. You just connect it wirelessly to the mobile device you already have (check to see if your device is compatible). It also works with Square Stand — all you have to do is plug it into the hardware hub. With affordable tools and in-depth guides (below) on all the new payments technologies, we’re here to help your business get EMV compliant. We want to make sure you can securely accept any form of payment that comes across your counter. The State of the U.S. EMV Migration: When Will Everyone Have Chip Cards?